Rediff.com » News » Tigers running wild in New Delhi! Tigers running wild in New Delhi! Rediff.com's Sahim Salim reports on a unique project to help preserve India's national animal. A streak of Royal Bengal tigers are making their presence known in New Delhi. Some of them are already standing at schools, malls, the international airport and exhibition centers, while the others are getting ready to find their spots. 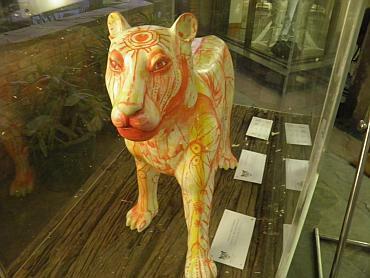 58 of India's finest artists and 50 corporate companies came together for a cause -- saving the tiger -- and brought about the creation of The Tiger Trail in the national capital under an initiative christened Artiger--Art for the tiger. Aparajita Jain, who runs art gallery Seven Arts, Nandita Baig a NGO founder and advertisement firm owner Swapan Seth, conceptualised the project after witnessing the Elephant Parade in London. "In June last year, I went to London along with two of my friends and we saw the Elephant Parade there. We came back and re-met and thought why the same concept cannot be applied here in India over the burning issue of the depletion of our tigers. Thus the Artiger was born. All three of felt very strongly about the issue and we set about contacting India's finest artists and they agreed instantly," Aparajita Jain, one of the three co-founders of the project says. 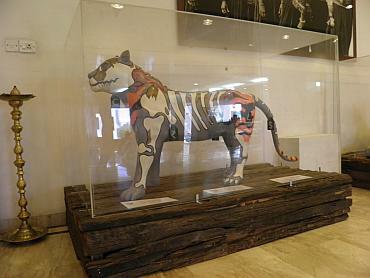 Artists from across the country Baroda, Kolkata, Mumbai, were contacted and they were given a dummy tiger to work on. They then put their interpretation of the cause on their tigers. 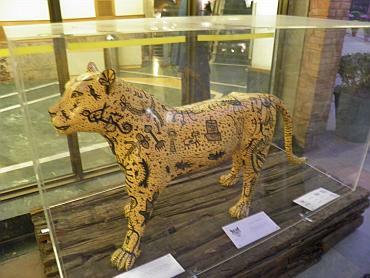 Artist Anjum Singh, who is based in Delhi, wanted to show the "preciousness" of a tiger. 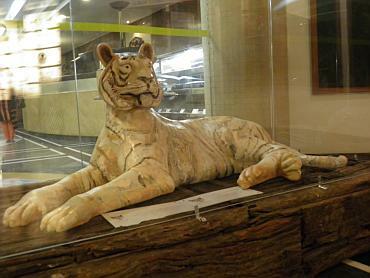 "I gave my tiger a gold-antique look, with pins stuck all over its body. I wanted to show how precious our tigers are and that is why I used gold and silver colors. The pins signify protection. I wanted to show a protective layer on the tiger's body to show that they need to be protected," says Anjum Singh. Singh says that it is a wonderful cause and that she would continue to contribute to protect the tigers. 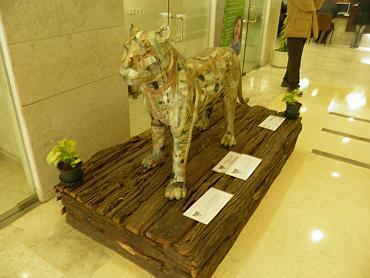 Sculptor Arzan Khambatta, who is based in Mumbai, wanted to show his tiger as a very commercial product. "Like a coconut tree, every part of a tiger is precious. A coconut tree, right from its wood to the coconut water is useful. In the same way, a tiger's parts, right from its claws to its teeth is marketable. So, I portrayed my tiger as a very commercial product," Khambatta said. making their majestic presence known for about three months, their respective corporate companies will claim them. And the project received a very overwhelming response. 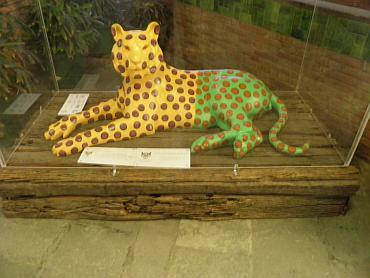 Says project coordinator, Geetika Singh Jamwal, "The finished tigers were displayed at Rashtrapati Bhawan from December 27- 29. We received about 100-150 visitors each day. We had not expected such a response." Some of these 'tigers' have found their spots across the city in public spaces like cinema halls, the India Habitat Center, The Epicenter and Fortis hospital. Within this week the rest of them will also find their spots. The proceeds from the auction will be donated to the Ranthambore foundation, a welfare society formed to create awareness among people to protect tigers and cat breeds in India. The foundation will then use the money to create economic options for people living on the outskirts of tiger habitats, to reduce their dependency on forests.